Bow Hammer Connection are a trio that command a giant sound reminiscent of experimental and noise-rock bands such as Battles and Shellac. Their art music underpinnings allow for a brand of music at home in clubs, warehouses, galleries and concert halls. Brendan Faegre’s drums are the secret to Bow Hammer Connection’s alchemy. They propel the music with an unhinged ferocity. Isa Goldschmeding’s violin soars above the foggy din of Micha de Kanter’s electronics, supplying sumptuous melodies. Sometimes the drums drop out entirely, leaving Goldschmeding and de Kanter to trade punches and stabs in brutal counterpoint. Is it chamber music, classical music or experimental noise? Bow Hammer Connection’s work isn’t easily pigeonholed. Faegre’s Dance Suite in G, for example, is inspired by drum’n’bass, acid house and dubstep. Other pieces sail off in the opposite direction. 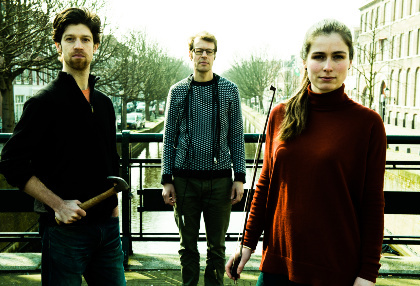 The trio are rabid musical omnivores, and their club showcase promises to be thrilling.